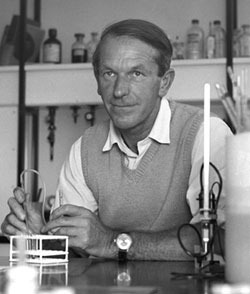 Fred Sanger, double Nobel Laureate and founding member of the LMB in 1962, died on Tuesday 19 November, at the age of 95. He was an extremely modest and self-effacing man whose contributions have made an extraordinary impact on molecular biology. Fred was born on August 13, 1918 in Rendcombe in Gloucestershire. His father was a GP and his mother was the daughter of a wealthy cotton manufacturer. He attended the Downs School, a preparatory school run by Quakers and then went to the Bryanston School in Dorset at the age of 14. In 1936 he became an undergraduate at St. John’s College, Cambridge. He originally intended to study medicine, like his father, but decided he would be better suited to a career in science. He became especially interested in Biochemistry after his arrival at Cambridge. After graduating in 1939 he was supervised by Albert Neuberger in the University of Cambridge’s Biochemistry Department where he began his PhD working on protein metabolism. In 1943 he started postdoctoral research with Professor Charles Chibnall, the newly appointed Head of the Biochemistry Department, who suggested that Fred should look at the end groups of proteins: the amino acids at the end of the polypeptide chain. Fred took this idea much further and decided to try to determine the entire sequence of amino acids in a protein chain, beginning with the two chains that make up the hormone insulin. This involved separating the different fragments of a protein on filter paper and then moving them with an electrical current according to their electric charge. This created a distinct pattern on the paper which Fred called a ‘fingerprint’. The information about these fragments then had to be reconstructed in the correct order, to give the sequence or ‘chemical structure’. By these methods, Fred revealed the entire sequence of the 51 amino acids of insulin and showing how they linked together. This was also the first conclusive evidence that proteins had a defined sequence. For this work, Fred was awarded his first Nobel Prize in 1958 at the age of 40 “for his work on the structure of proteins, especially that of insulin.” At the time of the Nobel Prize, Fred, who was funded by the Medical Research Council (MRC), was already in discussion with the neighbouring MRC Unit for Research on the Molecular Structure of Biological Systems, led by Max Perutz, to join them in plans for a new laboratory. 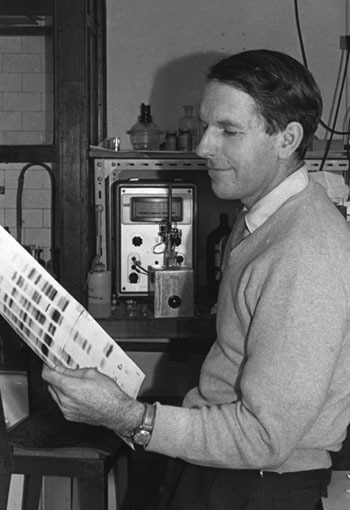 In 1962, the MRC Laboratory of Molecular Biology (LMB) opened, and Fred became Head of the Protein and Nucleic Acid Chemistry Division. At the LMB, Fred turned his attention to the sequencing of nucleic acids. 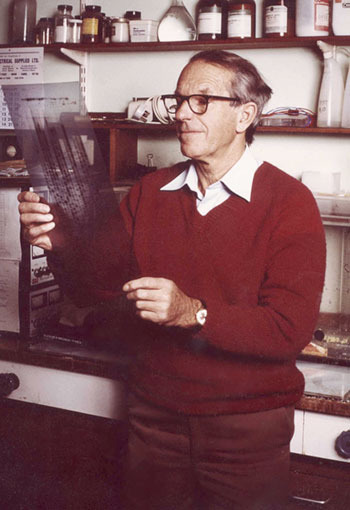 Initially he developed methods for sequencing small RNA molecules such as 5S RNA. Later he developed techniques to determine the exact sequence of the building blocks in DNA, culminating in the “dideoxy” technique for DNA sequencing, which allowed stretches of 500-800 bases to be read at a time. This work led to the first complete sequence of a virus genome, showing it had overlapping genes. Subsequent sequencing of the mitochondrial genome showed it had deviations from the universal genetic code. 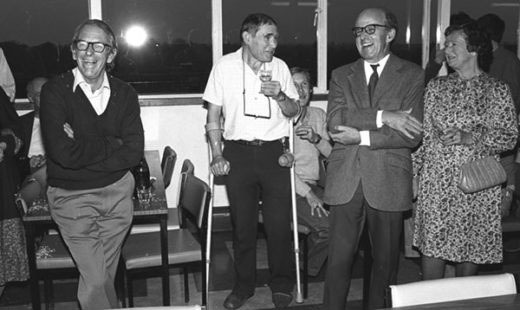 It was this work on DNA sequencing that led to Fred’s second Nobel Prize for Chemistry, received in 1980 jointly with Walter Gilbert (Harvard University) “for their contributions concerning the determination of base sequences in nucleic acids”, and with Paul Berg (Stanford University). The “dideoxy” method would shape the way that genomics and biomedicine were explored and was key to the Human Genome Project, the international collaboration to identify all the approximately 20,000-25,000 genes in human DNA. After the second Nobel Prize, Fred continued to work until 1983 when he retired at the age of 65 to spend time gardening and “messing about in boats”. His contribution to the science of genomics saw him being asked if he agreed to the naming of an institute after him. He agreed, but is said to have warned them “it had better be good”. Fred officially opened The Sanger Centre (now The Sanger Institute) on 4 October 1993. Fred was made a Fellow of the Royal Society in 1954, Commander of the Order of the British Empire in 1963 and the Order of Merit in 1986. He declined a Knighthood as he preferred not to be called ‘Sir’.